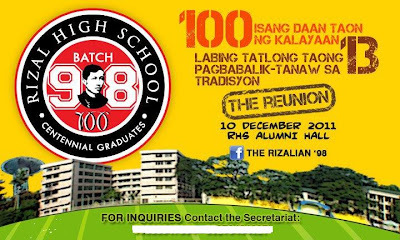 Thirteen Years after, I will be seeing my schoolmates this coming weekend for a Grand Reunion organized by a team of dedicated people, I’m actually excited! To plan and organize a gathering where 1000 people are expected to come is a no-joke. I’ve seen a few disappointments aired over in our group’s page in facebook by some inconsiderate people who, instead of trying to find a way to be of help with the organizers, chose to be pa-DIVa. Some comments may be reasonable but if people are already reaching out so that both ends could meet half-way, I don’t think we should make our confirmation of our attendance/presence as something hard for them to deal with. The big fuss over n’ over is somehow energy-depriving and irritating that’s why I’d like to commend my great batch-mates who took the challenge and were able to pull-off things altogether. 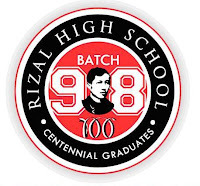 Because mind you, my school – Rizal High School is indeed one of the world’s most’ and once hold a record of having the highest population of students in Guiness record. 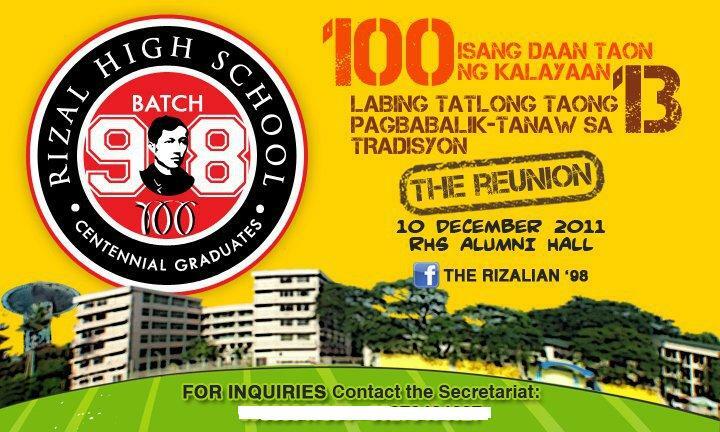 Who would tell me reuniting these students (1000+ in numbers) for a grand reunion is just a piece of cake? Nobody, I guess. Facebook has been a great help too to find and call everyone who's on for the gathering. One that got me off my feet is a video-invite that was released a few months ago. Astig! Kudos to the video maker, for taking an effort to create a short, simple but got SWAG video-invite :). I have yet to find the link of that video and will embed in this post soon. So why am I writing a blog when the happenings haven’t even started? Simply because I’m amazed with the organizers’ effort and hard work! Most of them have families of their own but they spent time working on details to put up activities, small projects and meet at least twice a month to discuss the needs for the upcoming reunion. The batch had bingo bonanza, motorcade and even participated in a blood-letting project. Who wouldn’t be amazed? Hats off to you guys and I’m pretty sure all your effort will pay-off on the grandest day and most unkabogable reunion of all time will happen! 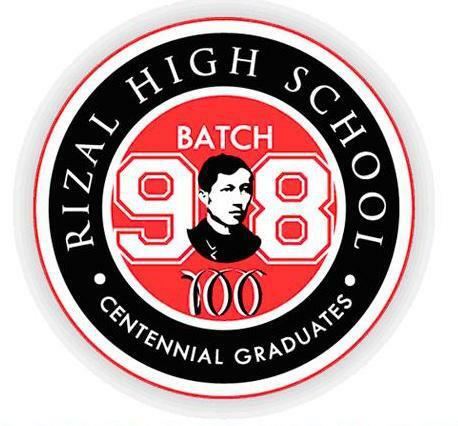 Rizal High School brood indeed rocks!